What Makes March 19th So Special? The day is March 19th. The place is San Juan Capistrano, California. A few days before this, a few cliff swallows arrived to scout out the area. On this day, called St. Joseph’s Day by the Catholics, every year without fail, thousands of the birds arrive from Goya, Argentina where they have spent the winter. They had left San Juan Capistrano on October 23rd and traveled 6000 miles to their winter home. Now, like clockwork, they return. The birds begin to repair and build their nests in the San Juan Mission which was built about the time of the Revolutionary War. Of course, they build their nests many other places in the area as well. Their arrival is a festive event, and a parade is scheduled for that day each year. Their nest is very unique. It is a covered bowl made of mud pellets, with a small entrance tunnel on one side. The cliff sparrows find a mud source, as far away as a half mile. They dig up a ball of mud with their beak and return it to the nest site. If they returned to an old but damaged nest, they will rep air it and live there. If all nests are taken, they will build another. 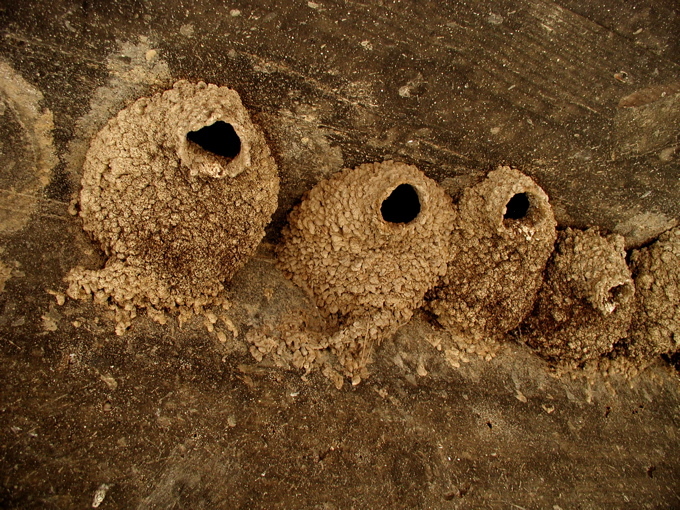 Both male and female cliff swallows construct the nest, slowly so the mud will harden. It may take one to two weeks to build it, using 900 to 1400 pellets. The mud pellets used to build the nest consist of sand and smaller amounts of silt and clay and contain grass stems, horsehairs, and feathers. Nest building is a group activity. Even unmated swallows will build a nest. 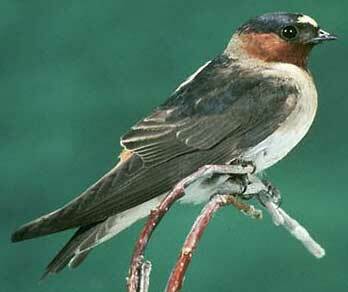 Mated swallows may build more than one nest per season, even though not all will be used. Once completed, they will line the nest with grasses, hair, and feathers. Then the female will lay one to six eggs to begin a new family. The cliff swallows are not always welcome. The bacteria, fungal agents and parasites found in swallow droppings and nests can carry serious diseases such as histoplasmosis, meningitis, encephalitis, salmonella, toxoplasmosis, and others. Their nests are eyesores on many buildings and their persistence in building them is not easily thwarted. The amazing feathers of this bird would be the subject of another fascinating article. The question here is, who put the calendar in the brain of the cliff swallow? How do they know when March 19th and October 23rd are? It sounds suspiciously like it was designed by an Intelligent Creator, wouldn’t you say?